then to experience a running piece of local history. It was built in 1963, so if it had a high school anniversary it would share a table with Jose Mourinho and Quentin Tarantino. Running between Dubrovnik and the Elaphiti islands four times a day, it also presents the best way to get to popular Lopud, and it’s trademark sandy beach Šunj. We use it every day as part of our sea kayaking day trips, and to do a little fun math, an Outdoor Croatia guide spends an average of 350 hours riding it every year. Which also means, we know it pretty well by now. 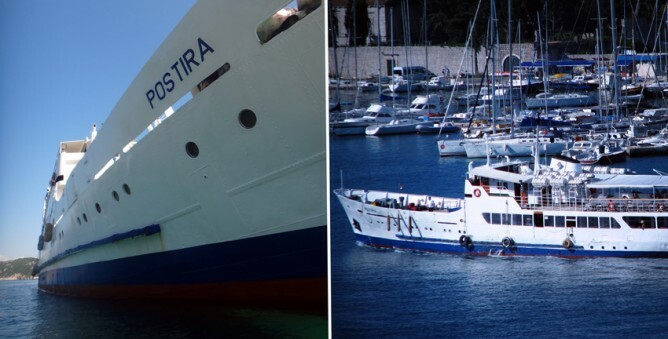 During weekdays first Postira of the day leaves Dubrovnik at 10am, packed with food, groceries, a door frame or a two, dogs and people, tourist and local alike. Oh, but no cars, it is a passenger ferry only, and that’s because there are no cars on Lopud. Why? Well, because there are no roads to support them. Mind you, that will not stop the locals bending the rules as far as they go, by introducing some very creative variations of golf carts that they use for transportation. The official Jadrolinija site tells that the full capacity numbers 450 people, but we have witnessed even more, especially when July and August arrive. Having that in mind it would be a wise choice to arrive a bit earlier and secure some good seats, or seats at all, and trust us, as the ferry ride takes a bit under an hour you’d want to rest your legs before a long day of swimming, sun bathing, and snorkeling. 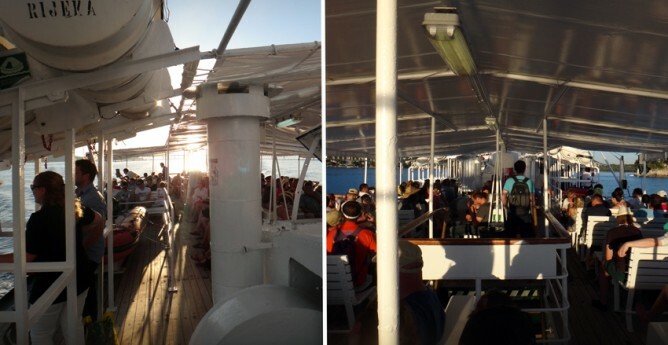 Ideal place for that is the upper deck, with its sitting benches, which also presents the best view of the entire area. Starting with the newly built Dubrovnik bridge, Daksa island just outside the main Gruz harbor, first of the Elaphiti islands called Koločep, and finally a breathtaking view of the Old Town Lopud, just as the ferry makes its last bend before docking. If you haven’t had time for a morning coffee, there is a fully operational battle station bar, which opens up just as the ferry leaves Dubrovnik. I don’t think we mentioned this, but it comes prity handy at 6am, when it leaves Lopud for Dubrovnik carrying with it local, half-asleep working people, students, and tourists catching those early flights back home. When on the pier waiting to board, you will notice two queues forming. Go to the first one and take your place on the front deck, now empty, with all of the stuff it carried this morning safely stored in all of the islands fridges. Stretch, and use a bag or the other half as a pillow, and enjoy the most relaxing ride back with the most unreal sunset you will ever see. You can check/download the full ferry schedule from Jadrolinija official site. If you are visiting Croatia, especially if you’re planning your kayaking holidays in Dubrovnik take a look at our Last Minute Offer. We are currently offering a 10% discount on our multiday kayaking tours starting June 2016. If adventure tours had their own ranking chart, Best of Croatia, being our most popular multiday tour, would be rockin’ at the top of the pops this season! 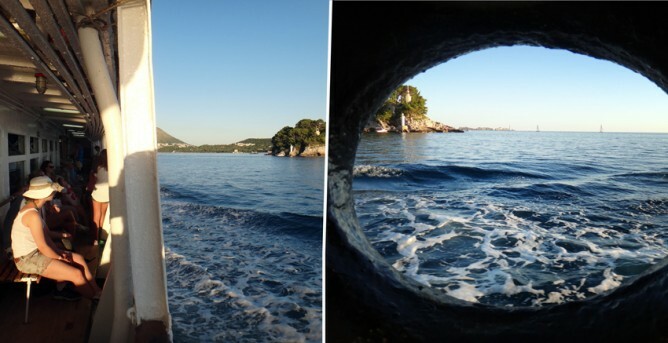 We embarked on a multiday sea kayaking tour, and went kayaking on Mljet Island a couple of weeks ago. Even if you are not sea kayaking enthusiasts, Mljet is still close enough to Dubrovnik, and is perfect for visitors coming to Dubrovnik to make a day trip out of it. 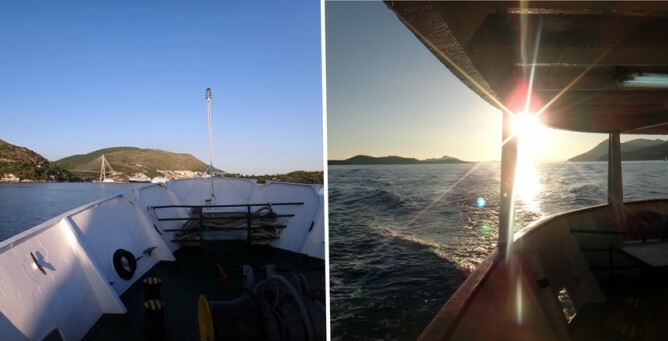 This little ferry may not be listed as a Dubrovnik attraction, or be on a list of what-to-do’s but it is definitely something of a must while in the area. It will charm you away on a day trip away from Dubrovnik. Plain old sea kayaking? We don’t think so! Many of our guests come to Dubrovnik wondering what to do after a day of walking the walls, sightseeing, chillin’ in one of many charming places that the Old Town offers. Sea kayaking is the way to go! …02.06.2014.